The AHA has delivered training to over 120,000 people since 1998. Our trainers are experienced hospitality professionals and we ensure students are trained in the most current and accurate information. This is WA's required course for all licensees and unrestricted Approved Managers who wish to be accredited. You must have completed the Responsible Service of Alcohol (SITHFAB002) course. If you have not completed RSA then take Option 2 below, the combined MLP1 & RSA training. Online Management of Licensed Premises MLP1 (MLPLCA401A) including Provide Responsible Service of Alcohol (SITHFAB002). This course is for all Licensees and unrestricted Approved Managers. It includes the Provide Responsible Service of Alcohol (SITHFAB002). For all Licensees and unrestricted Approved Managers who have already completed the Responsible Service of Alcohol (SITHFAB002) course (pre-requisite). 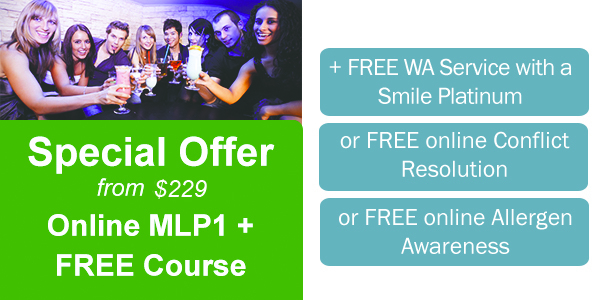 FREE Online WA Service with a Smile Platinum Course included! If you or your staff members have not completed the RSA unit of competency then take Option 2 below, the combined MLP1 & RSA training. The Management of Licensed Premises MLP1 course is available as a face-to-face classroom course at the AHA Hospitality Training Centre in West Perth. The nationally accredited RSA training course SITHFAB002 is a pre-requisite for this course. Please call us on 9321 7701 if you do not have your nationally accredited RSA certificate. Onsite Delivery Available. Contact us on 08 9321 7701 for a quote. The MLP2 elective course is for all individuals who have already completed the core unit MLP1. MLP2 focuses on managing licensed premises for the sale, supply and service of liquor to the general public. The MLP2 unit is recommended for individuals working in licensed venues that operate under a hotel, tavern, restaurant, small bar, special facility, liquor store or nightclub liquor licence. The MLP3 elective unit is for all individuals who have already completed the core unit MLP1 . The MLP3 elective unit focus on managing licensed premises used for the production or wholesale supply of liquor. The MLP3 unit is recommended for all individuals working in licensed venues that operate under a producers licence or wholesale licence. The AHA Management of Licensed Premises - MLP1 course, is approved by the Department of Racing Gaming & Liquor to deliver the Approved Managers Course. Each licensee and primary approved manager must complete a course in the Management of Licensed Premises conducted by an approved and accredited training provider, which the AHA is the oldest and most established. Completion of the AHA MLP course fulfills the training requirements to become an Approved Manager or Licensee in WA. To read more about the framework and download the lodgement guide, click here. Once you have completed your Approved Managers Course with the AHA(WA) and have received your certificate, you must now apply to be an Approved Manager and obtain an approved manager ID card from the Department of Racing, Gaming & Liquor. WHY APPLY TO BE AN APPROVED MANAGER? The licensee needs to appoint an individual (the "Applicant") to supervise and manage the licensed premises at all times when business is conducted at those premises. For those licences where there is only one licensee and the licensee is a natural person (an individual), that person may personally supervise and manage the licensed premises as if he/she were an approved unrestricted manager. Read the Department of Racing, Gaming and Liquor's Approved Manager Lodgement Guide. This will explain all the steps you need to complete to obtain your Approved Managers ID card. Click here to download the DRGL Approved Manager Lodgement Guide. Click here to visit the RGL website to setup your online Approved Managers account. While course dates and information are provided for your convenience on the AHA(WA) website and Training Calendar, please be aware dates and times may change. Contact 9321 7701 to find out more. AHA - Providers of Responsible Service of Alcohol (RSA) and Approved Managers Course (Management of Licensed Premises MLP 1), leaders in hospitality training.